Cercis chinensis ‘Avondale’ – The Chinese Redbud. 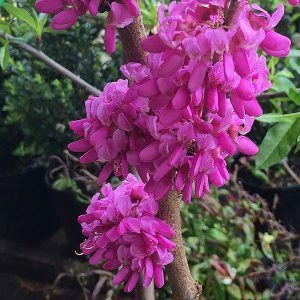 If you are looking for a small feature tree with brilliant spring colour, Cercis chinensis ‘Avondale’ could well be worth consideration. One of the best forms of Cercis chinensis, this is a small growing deciduous tree that grows well in most cool to temperate climates. Masses of deep purple flowers appear along the bare stems in early spring. The flowers are held close to the stems and appear in large clusters. As the flowers fade the foliage appears. Because of its naturally small size, Cercis chinensis ‘Avondale’ works well in a number of landscaping situations. As a feature plant in a small garden or courtyard, as well as large gardens where what it lacks in size, it makes up for in brilliant colour. Also suited for use as a street tree, where its height allows it to be planted beneath power lines. 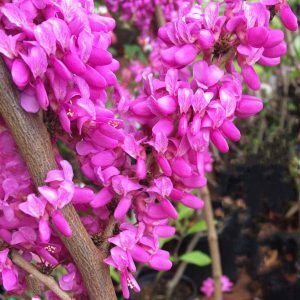 Also known simply as the Avondale Cercis, look for a plant with a good strong central leader when purchasing. Prune immediately after flowering to maintain shape and size. During long dry periods in summer, the occasional deep soaking may be required. Height – Will reach around 3 metres – easily pruned. Foliage – Mid green and heart shaped.